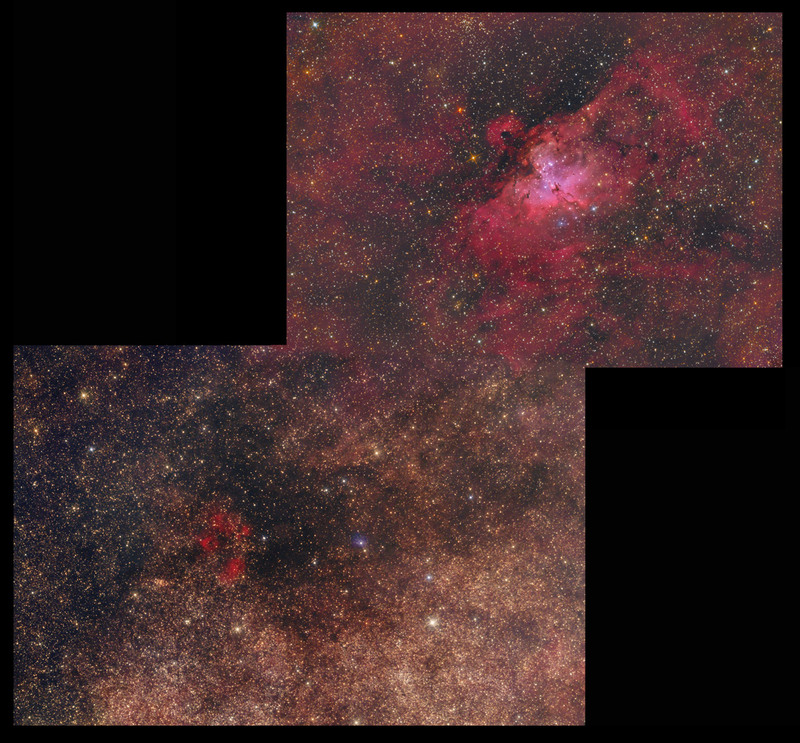 This image shows a 1.96 x 1.3° in southwestern part of the constellation Scutum, about 1.5 ° west of the famous Aquila Nebula (see the mosaic below). Two nebulae can be seen here: VdB 122 and Sh2-53. VdB 122 is a small reflection nebula just right from center of the image. The nebula reflects the light of the blue star W Scuti, eclipse variable of the type Algol, with a spectral class B3 having apparent magnitude of 10.04 (variable between 9.92 and 10.57, with a period of 10.27 days). Estimates of its distance, based on the parallax measurements, are over 5500 parsec (over 18,000 light years). However, the uncertainty of the measurement makes this distance not very reliable. In general, it can be said that the star and its nebula are included in the Sagittarius Arm. The other object here is the emission nebula Sh2-53 (also known as RCW 166). 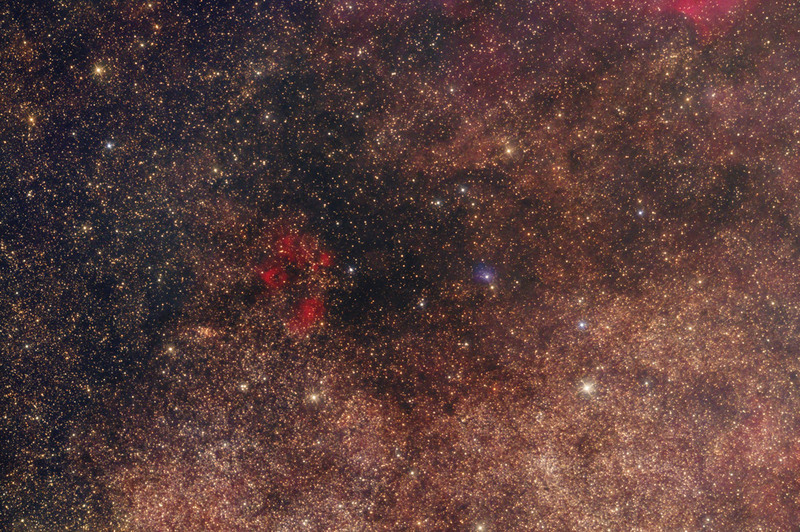 Visible left from the center, it is a large H II region located on the Shield-Cross Arm probably at the distance of about 3800 parsec (about 12400 light years), in a very inner region of the Milky Way. This distance puts Sh2-53 in relationship with the Scutum supershell, with which could be physically tied. The cloud is divided into six apparently distinct portions; five clouds of ionized gas were identified in the region around it, four of which could be physically linked to Sh2-53. Inside, there are active phenomena of star formation, given the presence of 13 infrared sources of radiation, four of which are cataloged by IRAS. Among these is IRAS 18224-1311, which is associated with the maser CH3OH.